Includes two start and end times for each day. 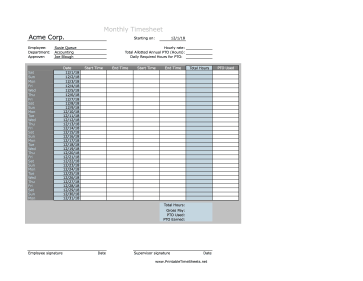 User must fill in start date, the hourly rate, total allotted PTO hours per year, the daily minimum of hours worked for an employee to qualify for PTO, start and end times, and PTO hours used per day. PTO is earned on a daily basis and assumes the employee works 260 days per year. PTO hours that are used are not included in the daily minimum of worked hours or factored into PTO earned for that day.